Pens U's Top Moments of the Season. Unfortunately, the Pens season was ended early at the mercy of the Philadelphia Flyers. Through all the injuries and adversity, several Pens broke out with career years. Now we have a chance to look back on the 11-12 season and remember those stunner plays. So without further adieu, here are the staff picks. Top Moment Pick: Matt Cooke's 82 game restraint. A lot can be said about Matt Cooke's 11-12 season. His "new look" game rewarded him with 38 points, 19 goals, 19 assist and a plus-5 this season, allowing Cooke to become even more of a role player on the team. Cooke was recently quoted on his changed game saying, "It’s a work in progress. It doesn’t just end now. It’s something that I’ll have to continue on for next year. I was able to make a change in my game and I’m happy for that. It’s an ongoing process and it’s something I’ll continue to have to work on." Top Moment Pick: Malkin's 50th goal of the season. Malkin became the ninth player in Pittsburgh history to reach 50 goals and the sixth Russian-born player in NHL history to hit the 50 goal mark this season. HC Dan Bylsma had this to say about Malkin notching number 50, "It's a huge accomplishment to be able to cap that off and get the 50th for him, it's great. I think everybody was cheering that puck in the goal for most of the game." Top Moment Pick: Orpik's hit on Paille. "Lots of symbolism there. Great example of what they were doing right in February and what was missing in the last month." Brooks Orpik is undoubtedly a leader one and off the ice. This hit on Daniel Paille shows Orpik's "blue collar" style that represent the city of Pittsburgh so much. Top Moment Pick: Crosby's comeback. "The reaction of the crowd and Sid after he scored was something special. The moment we waited for so long finally happened. I know he went down again and came back with less fanfare, but that first comeback I will remember for a long time." the words of Billy Myers can speak for many Pens fan regarding the return of Sidney Crosby. It was a long awaited event that had some fans on the edge of madness. But in the end it was surely worth the wait. 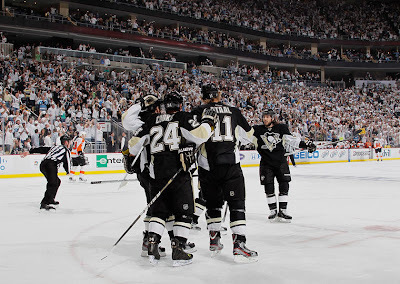 Top Moment Pick(s): Malkin, Neal, Sullivan; Fleury's Game 5 performance. Just watch that Malkin goal about 500 times. Never gets old. A taste of what Marc-Andre Fleury did for the Pens during Game 5 and really all season long. Flower has taken his fair share of criticism but there's no doubting he's becoming elite. Top Moment Pick: Jordan Staal's Game 4 hat trick. It's safe to say that Jordan Staal was one of the best players on the ice for the Pens this post-season. His hat trcik being a prime example of what Staal is capable of doing. With the uncertainly of the CBA and Staal and Crosby both needing contract extensions before becoming FAs next season, Ray Shero is going to have his hands full. It will be interesting to see what Shero will be able to do to possibly keep a sure key component to the team. Top Moment Pick: Pascal Dupuis' 17-game point streak. Pascal Dupuis has proven to be a Shero "steal". This season Dupuis made Hossa look the joke of a past deal. Key role player and nothing less. People always talk about secondary scoring, well here is your man. Now we prepare ourselves for the off season, free agency and then before you know it, training camp. Shero has already said he has a challenge ahead of him but what GM doesn't? Rest will do this team good and we've just got to hope and pray that the Hockey Gods are a little more forgiving come next season, injury wise. Because with a core of gentlemen the Pens have and all the returning role players, this team will be just as good. They'll have a chip on their shoulder and unfinished business to take care of. What was your favorite moment from this past season?